The reshoring trend, successes and possible pinch points, systematically explored and publicised by Aston’s Professor David Bailey since 2013, is the subject of new research from EY. Readers new to the subject could also turn to Bryan Luoma for his concise overview of out-sourcing problems. Examples of this trend in the region have reported on a sister site, including entry’s RDM Automotive and Birmingham’s Brandauer – both reshoring and multi-skilling. As Cathy Taylor, EY’s senior partner writes, reshored firms find that a ‘cluster’ in the appropriate sector will offer close proximity to key suppliers, infrastructure and a workforce with the relevant skills and these are to be found in areas like Coventry and Aston/Hockley/Newtown. 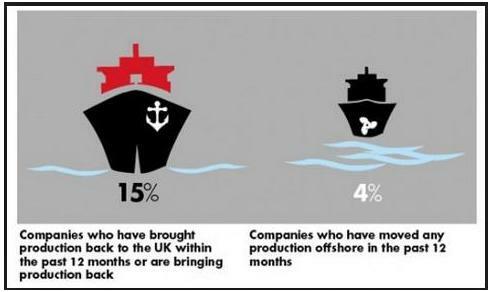 Cathy Taylor reports estimates that re-shoring could add £15.3bn of GDP to the UK economy and equate to more than 315,000 jobs across the UK. The West Midlands is one of five regions that offer the greatest re-shoring potential; others named are the East Midlands, North West, South East, Yorkshire and the Humber. “My colleagues and I have found that importing goods from China to developed countries (for example, the US) entails numerous increased costs: transportation, inventory carrying, and production and logistics oversight. The combination of these increased costs, just-in-time manufacturing needs, and increased developing country labour rates contribute to the economic viability of localised flexible manufacturing facilities serving developed country markets”. This entry was posted on Thursday, March 5th, 2015 at 9:48 pm and is filed under Analysis, Engineering, Manufacturing, Reshoring. You can follow any responses to this entry through the RSS 2.0 feed. You can leave a response, or trackback from your own site.